Marion Billet studied children's book illustration at the Emile Cohl School. 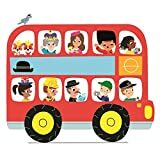 Marion is the author of around 80 children's books in 11 different countries, including the Whizzy Wheels series (My First London Bus, My First London Taxi, My First Digger, My First Tractor, My First Train and My First Fire Engine) as well as Hello! London. Her illustrations have also appeared in magazines, on stationery and toys, and on children's furniture and clothes.